Welcome back to another edition of Remembering the Magic. 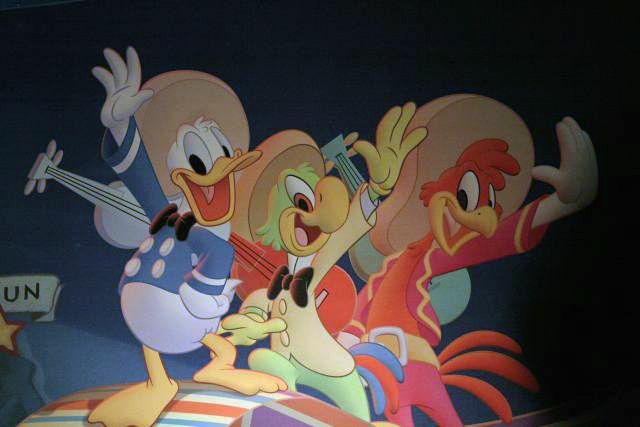 In this edition, we'll look back on the history of the current Gran Fiesta Tour Starring The Three Caballeros, which can be experienced in the Mexico Pavilion in Epcot's World Showcase. The Mexico pavilion in Epcot's World Showcase is first on the left proceeding clockwise around the lagoon from Future World. MousePlanet file photo. El Rio del Tiempo (translated as The River of Time) was an 8-minute dark, slow moving boat ride through some of Mexico's history. After the riders loaded onto the boat, they slowly moved past an ancient Mayan pyramid on the left side. On the right side were diners at the San Angel Inn Restaurante, a table service restaurant inside of the Mexico Pavilion. The boat slowly rounded the curve around the front of the pyramid, appearing to enter the pyramid on the side through a tunnel. Once inside the tunnel, the ancient history of Mexico was depicted on screens framed by models of native Mexican architecture. Actors in the videos performed re-enactments of native Mexican dance and other activities in traditional dress. The video section occupied the first third of the ride. The second third of the ride resembled "it's a small world" with its cartoonish scenery and dancing dolls. One set of dolls resembled a Dia de Los Muertos mariachi band. The music transitioned from traditional sounds to a more upbeat, mariachi style of music. 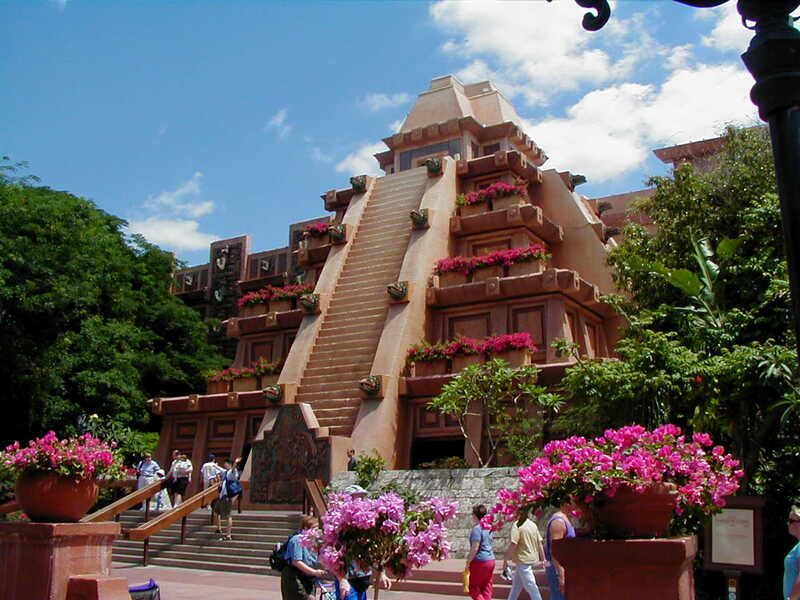 The final third of the ride transitioned back to screens set in scenery again, but a more modern Mexico is shown, highlighting its markets, beaches, and resorts. A series of screens set within a market scene showed two vendors at an outdoor market who addressed the audience and attempted to sell their wares, following the boats as they floated along. One of the final scenes was generally a fan favorite. This scene was made to look like the boats were floating outdoors on a dark night, with a black sky overhead and city skyscrapers illuminated in the background. To the left is a carousel with full-sized marionettes wearing traditional Mexican attire in place of the usual horses and other animals. Fiber optics embedded in the ceiling light up to resemble fireworks bursting above. The ride closed on January 2, 2007 for a re-imagination into Gran Fiesta Tour Starring The Three Caballeros. This added a bit more fun and appeal to children. Opening on April 6, 2007, Gran Fiesta Tour Starring The Three Caballeros has the same layout as its predecessor; it is still a slow boat ride with most of the same scenery. The Mayan pyramid, ruins, and entry tunnel all remain the same. However, the ride is brighter inside and features The Three Caballeros on the screens with updated Mexican video footage. The soundtrack to the ride has also changed. A mural in the ride features the images of The Three Caballeros. MousePlanet file photo. The premise of the ride is that The Three Caballeros are performing a concert. The initial video screens show a short video clip introducing The Three Caballeros, but Donald is missing. Jose and Panchito, the remaining two caballeros, search Mexico for Donald, who is shown exploring the country engaged in various activities on the screens. Most of the screens show real video footage of Mexico with the animated characters drawn over the scene as if they were actually interacting with the people and places shown. The themes of the videos in the last third of the ride are very similar to the old versions, depicting parasailing, snorkeling, and cliff diving, among other activities. Besides changing the video footage and the soundtrack, the rest of the ride remained mostly unchanged. A small change in the dancing dolls area (the middle third) was the addition of a Donald Duck piñata; you can purchase a replica in the pavilion's shops. The biggest change was in the night scene at the end. The marionette carousel was removed in favor of a "stage" for the performance of The Three Caballeros. My verdict: revert, update, leave alone, or re-imagine? For anyone who has read my previous articles, you know that I am a lover of the "EPCOT Center" of yesteryear. I have typically said that I prefer the old, educational Epcot to the "Disney-fied" Epcot of today, where most of the educational material and rides have been removed in favor of a Disney character or promotion of a Disney movie. However, for this ride, I have to say I do enjoy it more as Gran Fiesta Tour Starring The Three Caballeros than I did when it was El Rio del Tiempo. I think the ride is now more fun and the soundtrack is as well. Although some people could see it now as a commercial for "Visit Mexico," I think it adds a bit of appeal for children, while also appealing to the curiosity of the adults who might have never been to Mexico but have wondered what it is like. For now, my verdict is "leave it alone." Definitely agree with the "leave it alone" - it's a nice attraction that entertains while following the theme of the pavilion. The update to the Three Caballeros was well done and still feels modern, so there's no need to do anything at this time. I'd much rather see effort put into adding attractions at EPCOT than junking something that works (I'm talking to you Norway/Frozen!). I think it needs some updating. While the Three Caballeros should stay, the theme should be about Mexico's land, history, and people; like France and Canada attractions. So rather than having them search for Donald all over Mexico and ending with a goofy performance, have Donald's buddies teach him about Mexico, like they did in the movie. I'm with you on the "leave it alone" thought. There are a lot of folks who think that we all want Disney to stay the way it was when we first went. But this was a change that me and my family love. When we first rode it on our honeymoon, it was bad enough to skip it on our second trip in 2004, as well as the next trip in 2006. By the time we came back in 2008, we took the kids (3 and 1) on it and we all loved it. "Come back with my bathing suit!!!" Of course, Donald Duck is my favorite so that makes this rather slow and uninteresting ride a must-do on each trip. And with the kids, it's a must-do twice each visit. It helps that the line is always about 3 minutes long.